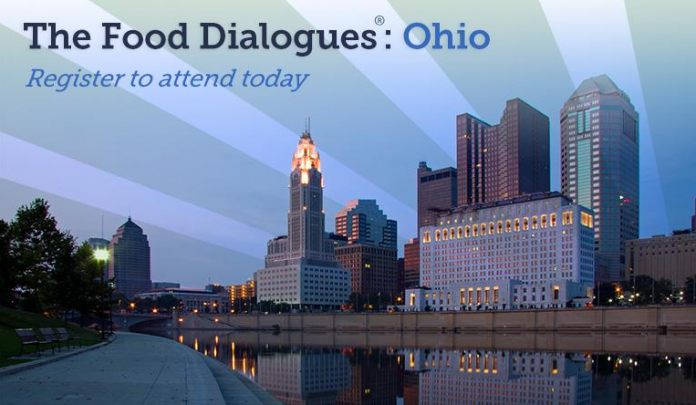 Read Will’s commentary on The Food Dialogues: Ohio. 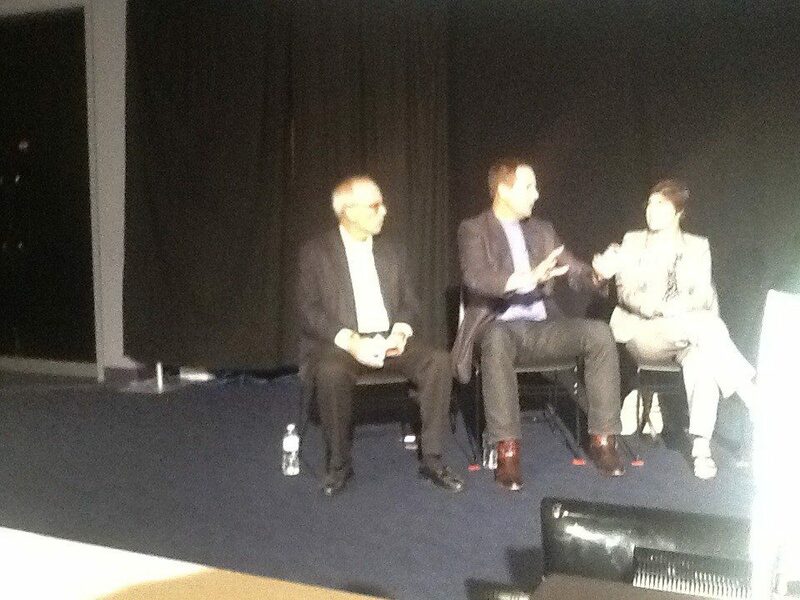 2:00 The final panel discussion has ended at The Food Dialogues: Ohio event in Columbus, Ohio. Thanks for reading Farm and Dairy’s live coverage of the event. Joe Logan, director of agricultural programs, Ohio Environmental Council, disagreed. He argues that consumers have a right to know what they’re buying. He then said that GMOs are a tool than can be used, but are not necessary for a sustainable future. 1:41: Lisa Hamler-Fugitt, Ohio Food Banks Association, brought up an interesting point. Many third world countries are becoming second world and first world. The citizens of those countries are interested in eating what The United States eats. That could have an impact on the sustainability of our own food system. 1:36: Regarding equipment, Ben Sippel chimed in again with, “There’s a reality that comes along with a mortgage. Equipment is a good thing.” The audience laughed, but for many farms, large equipment is a necessity. 1:31: A question was asked from the audience about good mentorship programs for young farmers. Ben Sippel, Ohio farmer, addressed the question with a bit of frustration. He said there’s good programs, and not so good programs. One of the largest problems, he said, is “Many young farmer mentorship programs are done on farms where they’re not making a living farming.” When crop insurance was mentioned, Sippel mentioned that federally subsidized crop insurance is making it difficult for young farmers to get a foothold. RT @OHSoybeanAssoc: #FoodD Ben Sippel "Subsistence agriculture is potentially disastrous for this country." 1:15: Riley asked the question, “What makes our system unsustainable?” When Lisa Hamler-Fuggit, Executive Director, Ohio Food Bank Association, answered the question, she advocated for keeping nutrition policies in the farm bill. She also commented that specialty crop producers need to continue to have access to capital, giving them the ability to grow those crops. Remember, you can follow along with the discussion on Twitter with #FoodD or watch live video of the panel discussion http://ofbf.ag/fooddialogues. 12:54: The panel discussion on sustainability should begin shortly. Lunch is wrapping up, the panelists are in place and the auditorium is slowly filling with audience members. The first panel discussion has concluded at The Food Dialogues, hosted at COSI in Columbus, Ohio. The next panel discussion begins at 1 p.m.
12:00: The final question posed by Riley was, “Where do you (the panelists) go for the best information on your food?” The panelists are advocating scientific research, talking with farmers and educating themselves on GMOs and food safety. 11:59:The panelists are discussing the possible consequences of using GMO crops for feeding livestock. Dr. McDonald said that animals have been fed GMO feed for 20-30 years. If there were ill-effects of using GMOs, it would’ve been apparent by now. 11:30: The conversation lit up when Doug Billman, an organic dairy farmer, asked the question, “If GMOs aren’t an issue, why are you afraid to label GMO crops?” He addressed the question across the panel to Allen Armstrong. Dr. Ruth McDonald, registered dietician and professor of food science and human nutrition, Iowa State University, said it comes down to the cost of labeling GMOs. She also said that the food industry also has other, bigger, issues regarding food safety. Billman then added that the dairy industry, “got put under the microscope, yet the GMO sector doesn’t want the consumer to know what’s in their food.” Dr. Michel replied that all food has risks. He then added that GMO labeling may be misleading. 11:23: Riley moves the conversation to nutrition. He said, “Are the foods we eat today more nutritious?” Jane Boback, registered dietician, said yes, today’s food is nutritious. 11:18: Allen Armstrong, Ohio grain farmer, commented that the idea that all food grown is GMO is wrong. He later added, “There’s no scientific facts that say what I raise is of harm to anyone.” The conversation then moved to Dr. Case Hoy Kellogg, Endowed Chair in Agricultural Ecosystem Management, OSU, who added that the reason why some consumers are worried is because there’s doubt that the precision is there. 11:15: The discussion about GMOs begins. Dr. Andrew Michel, assistant professor of entomology, The Ohio State University, started by saying, “Virtually all crops we have today are genetically modified.” We went on to say that through one way, or another, we’ve made fruits, and vegetables different over time. 11:05: Joel Riley, morning host, 610 WTVN, gives a short introduction for the live audience and the audience online. He also cracked a joke about having, “a face for radio.” It appears to be a full-house here at COSI in Columbus, Ohio. 10:50: The panelists are getting ready. Farm and Dairy’s tech whiz, Will Flannigan, is traveling to Columbus, Ohio, to cover The Food Dialogues: Ohio. The Food Dialogues: Ohio, in collaboration with the Ohio Soybean Council and Ohio Farm Bureau Federation, places experts, representing a variety of perspectives, on panels to discuss food production, farming technologies and the environment. The event will feature two discussions focused on biotechnology and sustainability, moderated by WTVN host, Joel Riley. The first panel discussion will focus on biotechnology (GMOs). The discussion will explore the role science plays in food production. The second panel discussion will focus on sustainability. How sustainable is our food system, and what effects does it have on our environment and economy? Will plans on updating frequently on our website, but he will also Tweet and Facebook updates from the event. Look for video, audio, photographs, commentary and reactions as the day goes on. You can follow Will and Farm and Dairy on Twitter or Facebook.